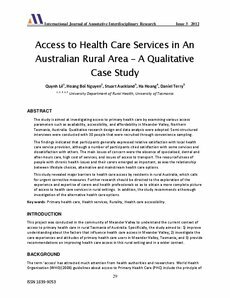 The study is aimed at investigating access to primary health care by examining various access parameters such as availability, accessibility, and affordability in Meander Valley, Northern Tasmania, Australia. Qualitative research design and data analysis were adopted. Semi-structured interviews were conducted with 30 people that were recruited through convenience sampling. The findings indicated that participants generally expressed relative satisfaction with local health care service provision, although a number of participants cited satisfaction with some services and dissatisfaction with others. The main issues of concern were the absence of specialised, dental and after-hours care, high cost of services, and issues of access to transport. The resourcefulness of people with chronic health issues and their carers emerged as important, as was the relationship between lifestyle choices, alternative and mainstream health care options. This study revealed major barriers to health care access by residents in rural Australia, which calls for urgent corrective measures. Further research should be directed to the exploration of the experience and expertise of carers and health professionals so as to obtain a more complete picture of access to health care services in rural settings. In addition, the study recommends a thorough investigation of the alternative health care options. Primary health care, Health services, Rurality, Health care accessibility.